The ruling United People’s Freedom Alliance has accused opposition presidential candidate Maithripala Sirisena of hijacking its Facebook account – but an opposition spokesman has defended Mr. Sirisena’s right to use the account. UPFA General Secretary Susil Premajayantha has complained that the Facebook account is now being used by Mr. Sirisena for his election campaign and demanded that it be restored to the UPFA. Former Fisheries Minister Rajitha Senaratne, who is a spokesperson for Mr. Sirisena, defended the use of the Facebook account saying, “We have been functioning as UPFA members even after the crossover. Therefore we cannot be questioned on this.” He said earlier it was the official page of the UPFA and following the defection of Mr. Sirisena it was being updated by his followers. “Nobody can ask for the ownership of another individual’s Facebook account. If they are trying to have it, let them try,” he said. The state agency that overlooks Facebook issues – the Information and Communication Technology Agency (ICTA), has received a complaint, its Strategic Communications Director Athula Pushpakumara said. He said the complaint was made to ICTA’s security arm, the Sri Lanka Computer Emergency Response Team (SLCERT). Mr. Pushpakumara said, “We have taken up this issue with the Facebook authorities.” Among material now posted on this account are photographs, video clips and speeches made by National Democratic Front presidential candidate Sirisena. Currently, the Facebook account identified as “UPFA – a Bright Future”, has 100,000 likes with 300 more followers coming into the account yesterday. 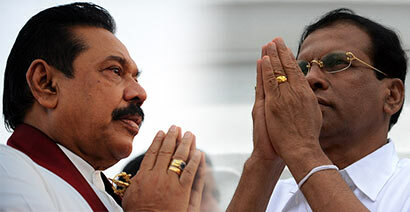 The account had been set up soon after President Mahinda Rajapaksa was elected for his second term in January 2010. Meanwhile, more than 5,200 complaints of fake Facebook accounts have been received by SLCERT. Mr. Pushpakumara said all these accounts had been created after the Presidential election was announced. They had initiated the process to remove these fake accounts. So far around 500 Facebook profiles have been blocked following the recommendation of the SLCERT. Mr. Pushpakumara said there were also complaints about 25 politically motivated websites run from abroad. These had been created after the proclamation of the presidential election. He said the ICTA’s mandate was to ensure a healthy cyberspace for the public, but if websites that provided misleading information could be blocked by the Government since they have failed to register with the Information Department. “Most of these websites are anti-government. We do not know where they are functioning from. These websites are more dangerous than the pornographic websites. We are urging the people, particularly the youth, to be vigilant about this type of politically motivated websites,” he said. Telecommunications Regulatory Commission Director General Anusha Palpita said they had not received any official complaints regarding these websites. He said if there were complaints action would be taken based on the merits of the complaints.